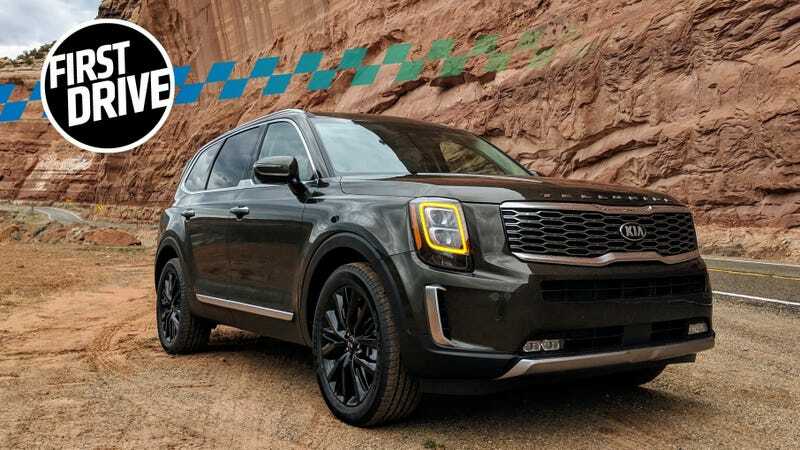 The 2020 Kia Telluride is a first for the automaker—a mid-size crossover truly big and beefy enough to compete with the Volkswagen Atlas, Toyota Highlander, Mazda CX-9, and other SUVs in its class. It’s highly competent, comfortable, and, dare I say, even fun. The days when Kias were tiny econoboxes with, shall we say, questionable build quality are a distant memory. Kias of the ‘10s have been among the most reliable cars on offer today, a winning on combination of value and quality, and solid proof that the company learned from its early mistakes. The Telluride offers a different proposition altogether. It seems perfectly timed to an American market that is buying big crossovers in droves, eschewing smaller cars that made Kia famous. The Telluride is on sale now, and has been for about a month; Kia says it has sold more than 3,000 of these in that time, an impressive sales number that puts it in the conversation with an SUV like the Atlas and surpasses the CX-9. Expect to see a lot of these on the roads in the coming years, in other words. It’s 197 inches long, 69 inches tall and has a curb weight around 4,110 pounds in its least-loaded trim. Equipped all the way up and with optional all-wheel drive, it comes in around 4,500 pounds. Of course Kia has been selling a three-row crossover for a while—the Sorento. However, with a length of only 189 inches, it’s a bit smaller than the usual benchmarks like the Toyota Highlander and Honda Pilot and is therefore a bit tight for families. The Telluride aims squarely at folks looking to avoid the minivan with a bigger entry that stacks up better against the larger, newer or updated offerings such as the Ford Explorer and Subaru Ascent. It’s powered by a 3.8-liter V6, offering 291 horsepower and 262 lb-ft of torque, which might seem a little low for a car in that weight class, but even in the optioned-out SX model Kia gave me to drive, that was more than enough for passing, provided you got a head of steam first. Let’s start with price: The Telluride starts at $31,690, which is sort of incredible, given that even its base package gets a whole host of features that you would find on much more expensive SUVs, like forward collision warnings, lane departure warnings, lane keeping assist, and adaptive cruise control with stop and go, for when you’re in traffic. Also, about the length: it’s shorter than the CX-9 and also a hair shorter than the VW Atlas. It can tow up to 5,000 pounds. You can also get 20-inch wheels on the Telluride, but you’re probably better off sticking with the 18-inch wheels, unless you love paying an even huger sum of money when the initial set of Michelins wears out. The drive modes—Smart, Eco, Sport, Comfort, and Snow—all worked as advertised, and you could feel a genuine change in drive dynamics between them, especially going from Sport to Snow. 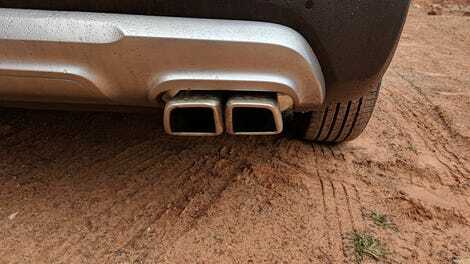 That latter mode pushes 80 percent of power to the front-wheels to help with traction, while gradually rolling back that percentage to 50-50 as the vehicle stabilizes. On a mud course Kia set us up with, it didn’t work wonders, but it did noticeably help stabilize things in a situation—cold, wet clay—where any car would’ve had a hard time finding grip. On the actual road, the Telluride is a rolling couch. In comfort mode especially, you can feel the road and (some) bumps, but the outside world mainly exists as an illusion, because inside the Telluride you’re moving along at your own gravity. Sport mode changes this a little bit, but not by much and the whole package is well-designed for comfort above all else. The Telluride has handles attached to the center console for the driver and the front-seat passenger, but these are cosmetic, because the Telluride would never deign to make you uncomfortable, or never deign to make you feel like you would need to grab on to something to survive. It’s a bit of a cliche, but the Telluride feels like a tank, but tanks as far as I know don’t have seven airbags. The fuel mileage you get—26 combined mpg for the front-wheel drive version, and 24 combined mpg for the all-wheel drive version—is also decent and would’ve been world-beating not too long ago, if not outstanding in its class. And it comes from an engine that, I’ll be honest, I expected a lot less from. Instead, the V6—which remains the same across every trim level—packs a punch, and is more than capable on the highway at speed. The touchscreen, like nearly all touchscreens, is horrible. This isn’t really Kia’s fault, exactly—no automaker that I’m aware of has made a good touchscreen, possibly because if you’re any good at making touchscreens you don’t work for an automaker or an auto parts supplier, you work for Apple—but the whole concept in cars deserves a rethink, since none of them can get it right. Perhaps that’s inherent in the design, since most drivers have to lean to reach and read center-consoled touchscreens, but Kia’s performed like the rest. Sometimes you would inadvertently hit the wrong button. Sometimes you would hit the right button and nothing would happen. Sometimes you would hit the right button and too many things would happen. Confusingly, there are also physical buttons below the touchscreen that also control different things on the touchscreen. In any case the setup was overly complicated and bad. Kia’s motto is “Give It Everything,” which they certainly have with the Telluride, both a blessing and a curse. The center console is a complicated mess—one Kia person approvingly compared it to the cockpit of a jet, which, nah—but that same approach serves it well in other aspects of the car, like with all of the safety features that come standard, the numerous charging ports and power outlets, and its massive cargo space with the third-row seat folded down. You can even get a bench seat for the second row, while seemingly every other feature in the world—an available feature called Driver Talk allows the driver to speak into a microphone and project their voice to the rear seats, in case, say, your large children are acting up and you don’t want to yell—is available for the higher-priced trims, themselves not terribly high-priced (and in fact lower-priced in many cases) compared to competitors. This strategy is big and bold and I love it, since Kia doesn’t pretend to go for respectability like the Germans do. No, Kia is opting to make a super well-equipped SUV specifically catered to its market. The Telluride was designed in Irvine, California, and is built in Georgia, meaning there’s nothing really Korean about it at all. It is huge and willing to entertain even the most outlandish of ideas, and thus feels ideally poised to succeed in America perhaps more than any other Kia before it. You want a cheap, reliable, big SUV, might as well get this.